Seven mile long Lake Anjigami offers you a chance to fish for pike, walleye, or lake trout. You can explore the surrounding woods for animal life, wild flowers, or to pick the delicious wild raspberries and blueberries. Couples may wish to reserve the "Loon's Nest"- a modern cabin for two, overlooking the lake and our beautiful sandy beach. Bring the extended family, and you can all spend time together playing pool in the warmth of our spacious Main Lodge. The Main Camp can accommodate up to 30 guests. Perfect for both families, and small GROUPS. The camp's solitude lends itself well to group retreats-- business, family, or church. If you really want adventure, and cherish the wilderness, we have something special for you! Five remote Outpost Camps offering solitude and great fishing. Step back in time to a place where the air is crystal clean, wildlife is abundant and the fishing is spectacular. 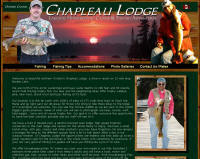 You have found Chapleau Lodge. The lodge is located on spring-fed Borden Lake in Northern Ontario, which produces some of the best fishing in Canada for Walleye, Northern Pike, Smallmouth Bass, Whitefish, Lake Trout and Brook Trout. Our location also produces many opportunities for photographing wildlife such as Moose, Black Bear, Loons, Bald Eagles and much more. Our accommodations include American Plan and Housekeeping cabins. Our dining room serves delicious cuisine that you won't find at other Northern lodges. Check out some of our menus! We have activities for the whole family such as canoeing and swimming in our heated pool. Borden Lake is a spring-fed lake over 12 miles long and up to 200 feet deep. There is 78 miles of shoreline with 87 islands. The base of the lake is Canadian Shield Rock, which supplies the water with the right combination of minerals such as Calcium and Mica to sustain incredible populations of fish. Lakes with low Calcium produce less fish. Being spring-fed has also protected the lake from global pollution. Chapleau Lodge is the only lodge on the lake, which has given us the ability to have some environmental control as far as a catch & release attitude, which has helped the lake sustain its incredible fish population. Borden Lake is also part of the Arctic Watershed, which makes it among the highest producing freshwater lakes in the World. Welcome to Four Seasons' Guiding. 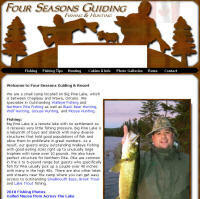 We are a hunting and fishing outfitter located on Big Pine Lake which is the top hunting area in Northern Ontario. We are located on the border of the Chapleau Crown Game Preserve. As a result, we have the best Black Bear, Moose, Wolf, Ruffed & Spruce Grouse hunting in Canada. Our trophy lake has great fishing for Walleye, Northern Pike, Smallmouth Bass and Brook Trout as well as Lake Trout in other drive-to lakes. Our housekeeping cabins are comfortable, clean and equipped with all the comforts of home. ATV trails are plentiful so you are welcome to bring your ATV's with you. Our deep and wide aluminum boats range from 12" to 16" with a choice of top condition motors in the 2 h.p. to 15 h.p. range. 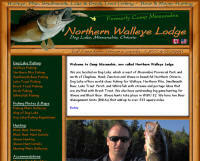 If you want Black Bear or Moose, Walleye or Northern Pike, then you have come to the right place. Kanipahow Wilderness Resort is located in a remote area; 3.5 hours north of the Sault Ste. Marie Michigan border; 9.5 hours north of the Buffalo, New York border. 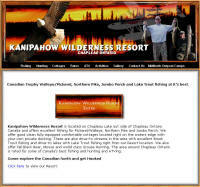 Kanipahow Wilderness Resort is a resort type setting catering to fishing, hunting and outdoor enthusiasts alike. The resort is located right next to the Chapleau Crown Game Preserve (world’s largest game preserve). Offering fully equipped modern housekeeping cottages including hydro, washroom facilities, linen, heat & air, along with a fully serviced camp ground for RV’s, tents and trailers. All nestled along the shores of the beautiful Chapleau River offering outstanding views of the breathtaking Northern sunsets. The Chapleau River with its 18 miles of boating and its many adjacent lakes produces excellent Walleye, Northern Pike, Jumbo Perch and Brook Trout. Just a short drive away Lake Trout fishing can be enjoyed as well. We also offer fall moose, bear and world class Ruffed Grouse and Sharp Tail bird hunting. Bring your ATV’s and explore the many miles of old logging roads as well as discover your own remote lake to fish. Our outpost camps offer Walleye, Northern Pike, Small Mouth Bass, Lake Trout and White fish. Our area and the surrounding lakes produce some of the best Walleye, Northern Pike, Smallmouth Bass, Perch, Lake Trout and Brook Trout fishing in Canada. The Lynn Family has been host to thousands of guests since 1957 as Ontario's top professional outfitter. Come and explore our web site and find out what all the excitement is about. You will find out why our customers come back year after year. If you are looking to hunt Black Bear or Moose, you have come to the right place. Moose Horn Lodge is located on beautiful McLennan Lake in the remote wilderness region of Chapleau, Ontario with the famous Chapleau River on one side and the Chapleau Crown Game Preserve on the other. The Chapleau area has the highest concentration of Black Bears in the world thus giving our customers an unusually high success rate. Normandy Lodge brings you your choice of either housekeeping or American Plan packages priced to fit your budget. We feature new Yamaha 9.9 HP engines on 14ft. aluminum boats equipped with cushions and paddles. Fibreglass canoes may be rented. Easy to read lake maps are available to our guests and we will happily point out the "hot spots" for good fishing. Kabenung is rated as one of Ontario's most reproductive lakes and considered by local people and our guests to be the area's most beautiful. You also will find excellent fishing for brook trout, lake trout and perch in the various lakes close to our lodge. Ontario fishing license and regulations are obtained at the camp store. The heavily wooded areas surrounding Kabenung Lake provide excellent Black Bear, Moose, and fowl shooting. Our Black Bear kill ratio is the envy of many other areas and hunting packages include such things as pre-baited stands, lodgings, meals and guides. Our hunting accommodations are strictly limited and require early reservations. Escape from civilization in your own private and remote cottage on beautiful Dog Lake. Unlike other lodges that pack you and other guests in close proximity, our spacious and attractive housekeeping cottages are spread out along Dog Lake's 120 miles of shoreline offering you extreme privacy. No noisy neighbors to spoil your hard earned vacation! Drive in to our base site in Missanabie, and in less than 30 minutes of arrival, you'll boat out to your own private cottage. Fully furnished and equipped, all have running water, gas grills and are wired if you choose to bring a small generator. In this private wilderness location, you can enjoy great fishing for Walleye, Lake Trout, Perch, Northern Pike, Smallmouth Bass & Whitefish. Boat & motor rentals, bait, gas, ice, groceries and fishing licences available. Free and secure parking for guests. You'll always return for another vacation in the Northern Wilderness. Our boat-in camp is family-owned and operated with quality customer service, a family atmosphere, and warm hospitality that will bring you back year after year. Our camp features rustic log cabins, with full amenities, in a remote wilderness setting. Enjoy satellite TV, a pool table, darts, games, and books. Visit the lodge store for licenses, necessities, and souvenirs. In the dining room, get spoiled with fine home-cooked meals. Simply relax by the fire while sharing your fishing memories (or tall tales). Unpopulated acres of outstanding fishing awaits you. There are abundant fishing opportunities on the clean & clear 13,000+ acre Dog Lake and numerous portage lakes, all featuring rocky shoals, bays, islands, rivers, and inlets. Hot spots are located on our map, and there are plenty of other hot spots for you to discover on your own. Enjoy the fight and bring in your limit of Walleye, Northern Pike, Lake Trout, Small Mouth Bass, Whitefish, and Jumbo Yellow Perch. Tucked beneath a hill covered with red pine trees is the spacious ranch style building of "Red Pine Lodge". The lodge has a pleasant rustic lounge, a large dining-room and three modern bedrooms. This is an ideal family vacation centre. Here we have lovely white sandy beaches and modern cottages, completely furnished for housekeeping, suitable for 2 - 10 persons. We also offer American Plan with delicious home-cooked meals served family style. Shore lunches are a must. Red Pine Lodge is located on the East Side of beautiful Ivanhoe Lake 11 Km. from Foleyet in the heart of Ontario's finest fishing and hunting districts. This lake with the 27 miles of Ivanhoe River lies among the hills studded with the stately red pine tree. Due to it's remote location, the James Bay Frontier still produces one of the best black bear, moose and wolf habitats. Let experienced outfitters, guides and staff provide you with friendly hospitality and the unforgettable opportunity to fulfill your dreams of big game hunting. Escape into the wilderness for a fishing vacation on Oba Lake. Accessible only by plane or the famous Algoma Central Railway. Our remote location, 212 miles north of Sault Ste Marie caters to fisherman and wildlife enthusiasts alike. With some of Canada's finest fishing for Walleye, large Northern Pike, Jumbo Perch and White Fish you will enjoy catching your limit easily at any time in the season. After a successful day of fishing, enjoy our beautiful beach, basketball or sauna. We have 14-foot aluminum Sea Nymph and Naden boats, which are ideal for this lake. You can bring your own motor (motors between 8HP-15 HP are recommended) or rent one from us. We offer new 9.9 Johnson outboards. Your boat will be conveniently beached near the cabin ready to go in the morning.